Mari Kråkemo Finnerud felt like she was struggling compared to last year’s dominating victory, but once again she was only a few minutes behind the fastest man halfway through the race. By the end she was part of a winning couple with two different men. 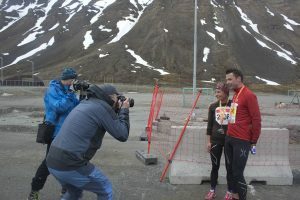 Mari Kråkemo Finnerud and Vegar Lie pose for newspaper and TV reporters following their victories in the full- and half-length Spitsbergen Marathon races on Saturday. Photo by Mark Sabbatini / Icepeople. Finnerud won her second straight Spitsbergen Marathon on Saturday and the Drammen resident had a second reason to celebrate as she was greeted by her boyfriend, Vegar Lie, who crossed the finish line a few minutes earlier to win the half marathon. She said they’ve run half-marathons together elsewhere, but having him here made her full-course run less harsh. Finnerud’s time of 3:03:57 was slower than her 2:58:06 race last year, but her win this year over the second-place finisher was even more dominating. She finished about 28 minutes ahead of Patty Terharmsel of The Netherlands whose time was 3:31:59, while last year’s victory margin was about 22 minutes. Rain before and during the race made for muddy conditions on dirt roads that make up a significant part of the course. But Finnerud said that wasn’t the main reason for her struggles. “This was much harder this year because I haven’t trained so much like last year,” she said. The race was Finnerud’s 12th marathon and, compared to other courses, the race in Longyearbyen ranks high both in challenge and enjoyment. A record 446 people participated in full-marathon, half-marathon and 10K races, about 75 more than last year. 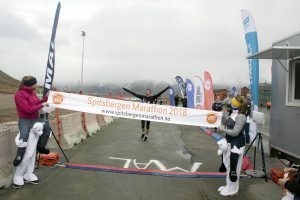 Piotr Suchenia crosses the finish line at Svalbardhallen to win this year’s Spitsbergen Marathon. Photo by Mark Sabbatini / Icepeople. The overall winner of this year’s full marathon was Piotr Suchenia, 38, following up on his victory in 2016. The Polish racer finished in 2:52:27, about two minutes faster than his previous time and nearly eight minutes ahead of second-place finisher Erben Wennemars of The Netherlands whose time was 3:00:12. Suchenia hardly seemed winded after the race, participating in multiple interviews with race officials and the media before seeking out any food or drinks. 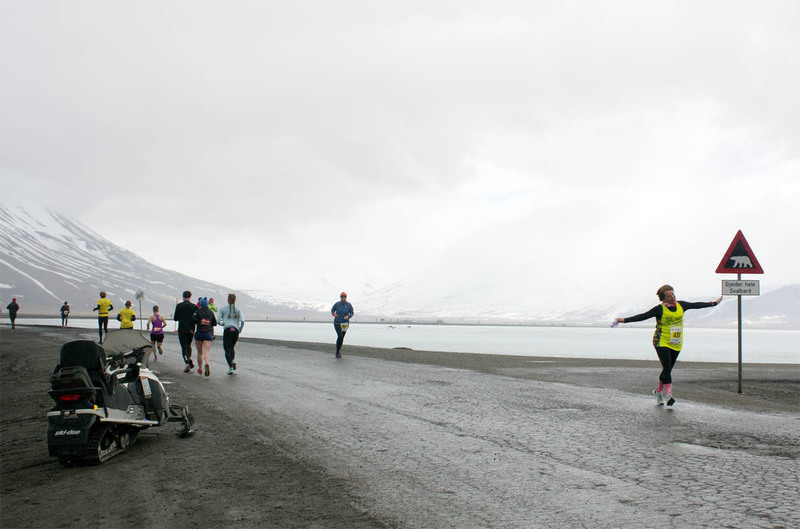 He said the marathon in Longyearbyen is as much an aesthetic as competitive experience. 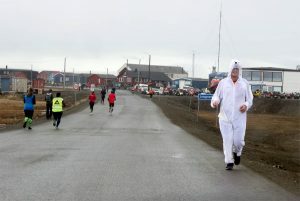 Suchenia said he’s run about 35 marathons worldwide and the Spitsbergen Marathon is “a difficult race. A lot of hills.” But it has a much more prominent quality. “It’s the most beautiful marathon on Earth,” he said. A runner in a polar bear costume works up an extra sweat during the Spitsbergen Marathon. Photo by Mark Sabbatini / Icepeople. But it’s far from the most extreme he’s run in – or won. He won the 2017 North Pole Marathon at the Barneo ice camp at 89 degrees latitude north and was the only participant among more than 40 not to take a break inside a tent to warm up. He said the circular ten-lap course is physically difficult due to surfaces ranging from hard ice to knee-deep snow. But he said the cold wasn’t part of the challenge. “It’s no problem running at minus 35 degrees,” he added. Suchenia said he dedicated this year’s Spitsbergen Marathon to his father, who died in January and was the inspiration to take up racing. “He was a good sportsman, but he didn’t run marathons,” Suchenia said.